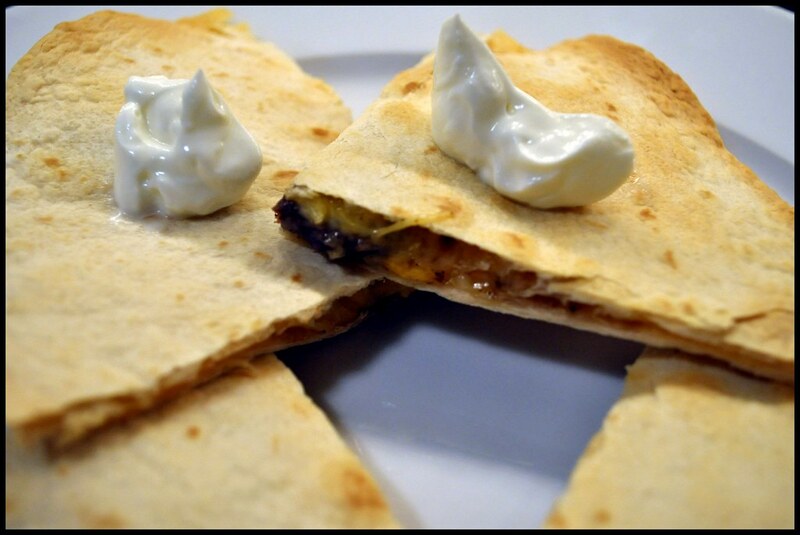 I served these quesedillas with the Curried Butternut Squash Soup for an easy weekend supper. But both recipes made enough so that we had a quick weeknight dinner all ready to go. If quesedillas aren’t your thing, the steak can be served on top of a salad, which is another way we got rid of the leftovers. And I can neither confirm nor deny that I ate a slice or two of cooked steak straight out of the refrigerator. To the best of my knowledge, there is no evidence of any such activities. BAH Note: BA-FEF recommends using a salsa or Pico de Gallo in the quesedillas and I wish I would have. The spice rub lost some of its punch in the cheese and tortillas so a little extra flavor would have been good. Or I could have used a hot pepper cheese. There’s no right or wrong with this recipe, use what you like and as much as you like. Some diced avocado would make a nice garnish along with the sour cream. Cut the steak into three or four large portions and dry with a paper towel. Season both sides liberally with spice rub. Heat the oven to 375 degrees. Meanwhile, heat a grill pan or large frying pan over high heat. Lightly coat the pan with a thin film of vegetable oil (I placed a bit of oil on a paper towel and wiped the pan to coat). Add steak to pan (if using a frying pan, you may need to work in batches so the meat sears instead of steams) and cook 3 to 5 minutes per side for rare (3 minutes per side) to medium rare (5 minutes per side). Transfer steak to a cutting board to rest for 5 minutes then slice thinly. Meanwhile, line a sheet pan with aluminum foil. Lightly oil one side of two tortillas and place on the sheet pan, oiled side down. Top each with 1/4 cup cheese and steak slices. Cover steak with an additional 1/4 cup cheese. Lightly oil a second tortilla and place oiled side up on top of the steak and cheese. Bake for 10 minutes, carefully turn the tortillas over, and bake for another 5 to 10 minutes until heated through. For a more browned exterior, quickly broil on low making sure not to burn the tortilla. Transfer to a cutting board or plate and cut into wedges. Garnish with a dollop of sour cream, diced avocado, or salsa. I’m craving steak now. Steak and mushrooms with a red wine/butter reduction. Roasted potatoes and a salad. Crusty bread to sop up the wine/butter reduction. Tracy, all I can say is that if you execute that meal, I want a phone call to join you. I have decided that I am exclusively using pepper jack for quesadillas. I love the punch it gives and it melts so beautifully. We are quesadilla hounds over here! If it weren’t for the fact that we’ve got two bags of shredded Monterey Jack in the fridge, I’d give pepper jack a try when we make these again this weekend. Who knows, maybe I’ll pick some up anyway. Brooke, this is so easy that even The Mistah could not get it wrong. Give it a go. Pepper Jack is where its at! I think this gets multiple thumbs up! I could only find a Mexican blend cheese @ the asian market today but that has some pepper jack along with monterey and sharp cheddar. I have a feeling The Mistah won’t complain. Mexican blend cheese at the Asian Market????? LOL! I do not think you can do anything to hurt this dish. I see it next week on my table. Emily, the asian market is incredible. Overwhelming but fabulous. For anyone reading locally, it’s H Mart on Rt 40 @ Rolling Road.